Magical and mystical is the elusive Snow Leopard. It is rated high on the endangered species list with 500 said to remain in Nepal. On this adventurous trek, you walk in the steps of Peter Matthiessen, author of The Snow Leopard, along the Bheri River, on to Ring-mo, and over Kang La pass, toward Crystal Mountain in the remote “Land of Dolpo,” Western Nepal. 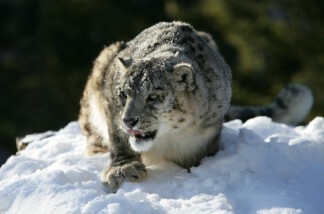 Visit the highest settlement of humans in Khangar (at 4440m) who have the elusive Snow Leopard in their village itself. The Snow Leopard Trek is a journey for those of you who want the challenge of glimpsing Snow Leopards in their original inhabitant. You are met by our representative at the airport and driven to your hotel. You are driven to the airport for your flight on a domestic carrier that takes 55 minutes to Nepalgunj. The flight takes 35 minutes to Juphal airport of Dolpa. Our trekking starts from Juphal descending through local villages of Juphal. Following the path along the riverside we reach the district headquarters of Dolpa, a small village called Dunai (2150m). Here are the government offices, police check post and some other service centers. All the official procedures are carried out here. We stay overnight in Dunai either at Pala Guest House or Blue sheep Trekkers Inn. We enter the Shey Phoksundo National Park and its headquarters at Suligard while trekking towards Chhepka, which has a few houses and lodges in the surroundings of wood. On the way one can have fun and enjoy birdwatching. The trail goes up and down along the forested riverbed and several streams on the way which soothes your heart. The trail continues along the valley to the camping site. We will camp for a night or stay in lodge at Chhepka. We start the trek to Polam through forests of big cedars towards a winter settlement used by the people of Ringmo village. On the way we can also visit the Bon School “Tapariza” on the way. We start up the dusty trail to a ridge at 3780 meters viewing the highest waterfall in Nepal (200 meters). Our route then continues into Ringmo village, a picturesque settlement of flat-roofed stone houses with lots of Mani walls. We camp at the national park camping grounds to the west of the lake. We take a day to explore the area around the magnificent Phoksundo Lake. The lake is famous for its magnificent turquoise color and spectacular scenery. Many beautiful glaciers can be viewed above the lake. There are many monasteries (Gompas) and Bon-po religious sites at the park and we will visit some of the very old and important monasteries. We will explore the natural sites and enjoy our nature tour. Moreover, if we are lucky enough and make a way around the lake we may catch a glimpse of the very precious and endangered species, the Snow Leopard. From Phoksundo we will start our journey by the side of lake climbing the trail which you might have seen in the movie “Caravan”, where a yak was fallen into the lake. We trek along the precipitous and narrow trail to the western side of the lake. We can have clear views of the peaks Shey Shikkhar and Kang Chunne, both just over 6000 meters. The trail then descends to lead us to Sallaghari our camp for the night. The place is in the woods, surrounded with snow-capped rocks. The area in the Base Camp where the Snow Leopard can be spotted is Perikopa where we will spend most of the day tracking. We can observe foot prints and droppings of Snow Leopard along with its preys. We will have ample chance to see the Snow Leopard in this area. The area around the Tshakang gompa is one of the most potential areas to spot the Snow Leopard as recommended by the SL specialist Mr. Kamal Thapa. We stay here for 2 days tracking around this area as there is a greater chance to encounter this beautiful creature in natural way. Many people have noticed the foot marks/scratches left by the big cat near their houses. It is believed that it likes to consume salt and various marks can be found in the salty rocks found around the villages. The abundance of bharal or Blue Sheep around the area also increases the possibility of occurrence of the Snow Leopard in this area. After staying 2 days in Tshakang gompa and around, we head towards Shyamling gompa. Shyamling is actually known as the oldest Bonpo gompa of the nation. Tantrike lamas like Sherap Tenjin of this gompa is famous for his tantric knowledge. We will have a chance to meet and interact with the lama. We leave Shyamling to lunch at Vijer. After the lunch we will interact with the local people. One can gather interesting folklores about the Snow Leopard from the aged people with their mixed experience of joy and sorrows. The people in this village know a lot about Snow Leopard because these people encounter them. They have good knowledge about the habits of snow leopard and they also have long experience on how to protect both their domestic animals and the endangered big cat. World Wildlife Fund or WWF Nepal has assisted the locals to encourage them in the conservation programs by providing technical knowledge and financial support. They have formed Snow Leopard conservation groups to guide the locals. From Vijer village we trek to Saldang crossing the Nengla pass (5368m). WWF Nepal has also supported the locals to form the Snow Leopard conservation groups in Saldang. The group is active in the conservation so the numbers of snow leopard is increasing gradually in this area. Thinly Lundup the leading actor of Caravan, the movie, who has been awarded with the Abraham Conservation Award also resides in this village. On this trail we will have a straight walk to Chhoregaon where we camp. Though there are several villages on the way, the place where we will camp has cluster of three or four houses only. On our way from Chhoregaon to Dho Tarap we will be crossing the pass Jyanta (5221m) which is also known as Chyngla pass. Most of the time, we receive mild precipitation on the pass. The trail is calm without any human disturbance. On this trail we will be able to see the prey of Snow Leopard and sometimes Snow Leopard too. The settlement of humans at the highest elevation is in Dho VDC in the village known as Khangar (4440m). You can gather more knowledge and legends from the villagers about the big cat. Sometimes people encounter the Snow Leopard in the village itself. It is pleasant and wide spread valley where you can enjoy other natural and cultural heritages. After taking a glance at the glorious heritage we start the trek from Dho and enter a highly potential habitat of Snow Leopard, Lang valley and Mirbhu, the pasture lands, where the local people make the shades for their cattle. Here we will have thorough surveillance of the area, the habitat of Snow leopard, ‘Lang’ the valley and “Mirbhu” the pasture. We have ample chances to spot the Snow Leopards around this area. Camp is here for the night. The trek descends to Chhugar through rocky hills surrounded by fir and pines. We will be descending towards the hilly region from the mountain desert. So, it will be a joyful walk along the riverside with beautiful sightseeing and birdwatching. We will start the trek ascending a little having the view of t Putha Himal and Dhaulagiri range then descends through rocky trails to Tarakot. Above the camping area there is a village where the people use to speak a typical language “Kaike”. From Tarakot the trail gently descends through small clusters of houses on the way. You can view several places for winter settlements. Then we will reenter the district headquarter of Dolpa, Dunai Bazar. Leaving Dunai we will head the only air strip, Juphal to spend the last night in Dolpa. You can enjoy and share experiences with your companions. The porters will depart for their homes after days of trekking. Transfer to the airport for your departure flight homebound or onward.